A Scherzer rolling lift bridge is a type of bascule bridge that has a pinion in each lever arm that sits on racks on the side span. As the counterweight falls the pinions roll on the racks and raise the bascule span. I had to walk several miles past a locked gate along the sloughs of Sonoma Creek to get to the Wingo Rolling Lift Railroad Bridge. The tracks carry the trains of the Northwestern Pacific Railroad (NPR) and the wooden boards can carry trucks. The bridge is hand operated with a chain to raise and lower the counterweight. Nautical charts list the bridge as movable and chalk marks on the counterweight indicate the bridge was last raised in 2007. 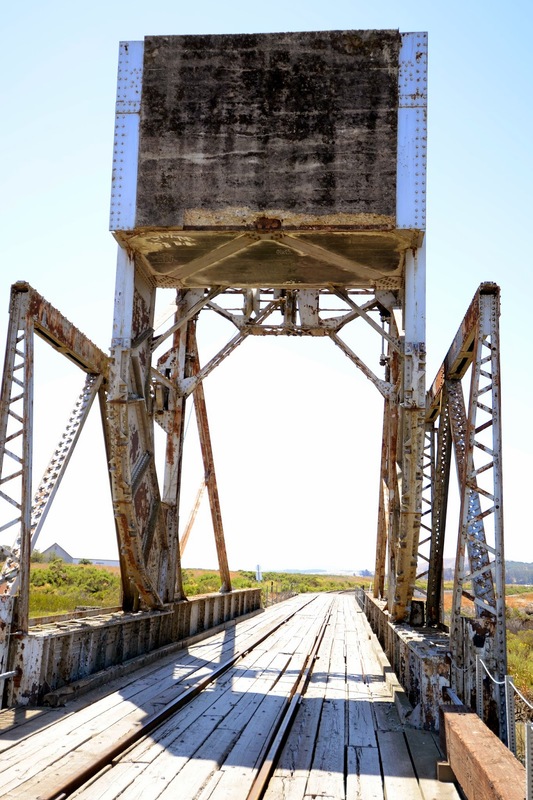 More information on this interesting bridge is available from the Bridgehunter Website. Sonoma County, California Bridges: Wingo Rolling Lift RR Bridge across a Tributary of Sonoma Creek by Mark Yashinsky is licensed under a Creative Commons Attribution-NonCommercial-NoDerivatives 4.0 International License.